Members of the work group walk around the Main Street church in the rain on Monday. 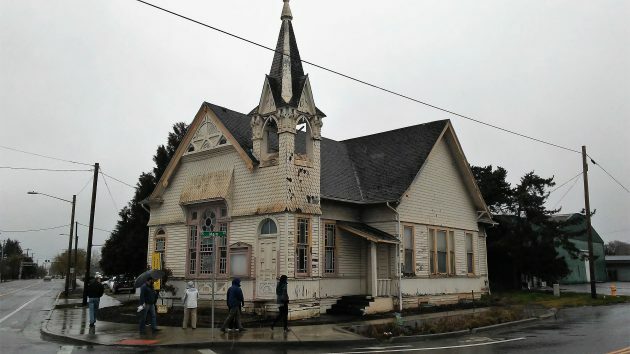 Saving the old church building at Main Street and Santiam Road in Albany won’t be cheap, if it’s possible at all. 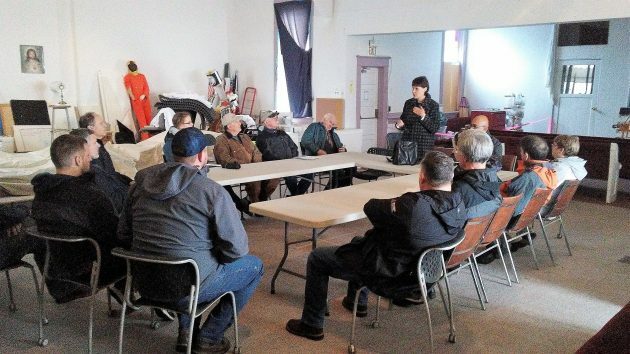 That much was obvious from the first meeting of a work group formed by Mayor Sharon Konopa. On Monday, the group met in the city-owned building and heard various cost estimates from Chris Bailey, director of public works operations. Restoring the structure in place might run around $250,000. Moving it to a city-owned site on Water Avenue would cost about $80,000. And the bill for renovating it there, including site work, could total $360,000 or thereabouts. The group took a look at the former church, inside and out, but didn’t talk about what if anything should be done with it. The mayor intends for the panel to meet several more times before, on May 22, trying to form a recommendation to the city council. Among the questions: Should the church be renovated? Should it be moved? If so, to private or public property? Or should it be sold as is? Or leased to a nonprofit? Parking is another issue, because there isn’t much space at the current site. When it was used as a church, members would park in the Carriage House Plaza across the street, someone said. The original part of the building, known as the Cumberland Presbyterian Church, is said to date from 1892. In the 1920s, so the story goes, it was split in half and pulled apart so a bigger sanctuary could be built in the center. The city of Albany bought the property for $150,000 in 2000 to make room for the reconstruction of Main Street. But the design of the street project later was changed and the property became surplus. In recent years it has cost the city about $6,000 annually in maintenance. Now, the Universal Coffee shop across the street rents the building as storage for $100 a month. Public works has removed and stored the church’s bell to keep its weight from damaging the tower, weakened by rot. The steeple itself is in decent shape and could withstand a move, the group was told.